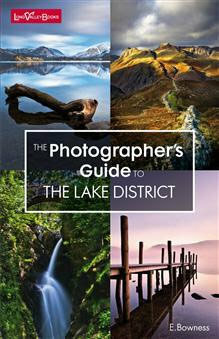 The Photographer's Guide To The Lake District is a definitive guide to all the great photographic destinations in the Lake District, of which there are a lot. The Lake District is renowned as a British beauty spot, and so it's not surprising that so many flock to the Lakes on a regular basis for photographic purposes. The book is split into sections, and each section covers a different area of the lake district, from Ambleside and Windermere to Grasmere and Rydal water, and everywhere in between. Each section begins with a map of the area, which features numbered pinpoints which are the key photographic destinations in that area. Each page after this is dedicated to a number and shows brilliant photography from various photographers taken in that area. Each page has an explanatory paragraph about the destination, pointing out the key photographic appeal that it has. There is then a paragraph on how to get to the destination, including road numbers and clear directions. Each destination also has an OS grid reference provided for it, making it really easy to plan the trip beforehand. The book also includes notes on the seasons and which destinations might be better in which season, sunset and sunrise times at different times of the year, weather conditions to watch out for and parking destinations. There is also a particularly useful summary of all the locations in a table, including information such as how far away each photographic destination is from the parking point, how difficult of a walk it will be, and how interesting each one is to photograph, helping you to make an informed decision on which photography hotspot you want to head to. This book is a great idea, and provides clear and concise information about the many beautiful photography points of interest in the Lake District. Of course you should still explore and go off the beaten track to find great photos, however this book is a good starting point if you're holidaying in the area or just want to learn more about it before heading out with the camera.